Let's face it: most guys are not all that into flowers. And yet, the boutonierre is one of the few colorful accents available to the groom and his attendants at a wedding. The solution: choose one of these funky modern wedding boutonierres which truly reflects the groom's personality and the style of your wedding; flowers are entirely optional. The modern approach to boutonierres is long overdue. For years now, brides have been finding creative ways to make their weddings beautiful while breaking the mold, yet there have been few opportunities for the groom to try his hand at a little creative expression. Finally, there is an opportunity for the guys in the wedding to have a bit of fun with their attire (or at least for the bride to try something new), in the form of the whimsical and unique boutonierre. A boutonierre can be almost anything, as long as it is small and lightweight enough to fashion into a lapel pin. 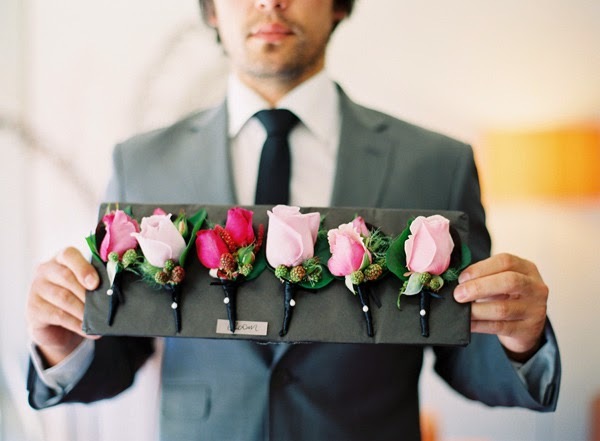 It can tie in with the wedding theme or simply showcase one of the groom's passions. As it is intended to be a decorative accessory, whatever is chosen should also be attractive and visually interesting. For instance, if you were having a nautical theme wedding, tiny sailboats fashioned into boutonierres make charming accents for the gentlemen. Wrap the stems in striped grosgrain ribbon to capitalize on the preppy feeling of a nautical wedding. The same idea would work just as well for a wedding without a nautical theme, if the groom happens to be a passionate sailor. Beach weddings are ever popular, and lend themselves to some great creative boutonierres. A tiny bunch of seashells on wires can be gathered into a beach-worthy lapel pin for the groom and groomsmen. For extra visual appeal, you can layer in a small starfish, sand dollar, or a piece of faux coral. Not only will the unique boutonierre suit the theme of the wedding, but it will not run the risk of wilting under the summer sun like a fresh flower. 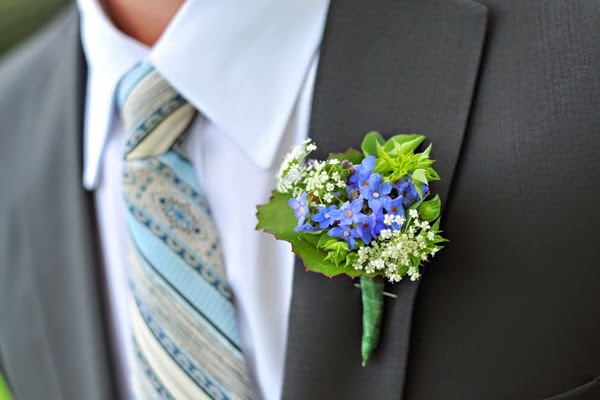 If you are looking for something unique to craft into a lapel ornament for your groom, take some time to consider his hobbies. Does he love to while away the afternoons fishing? Great! Many fly fishing lures are really cool looking, and could very easily be transformed into boutonierres. Some couples are going even further, and turning favorite vintage toys from their childhood into lapel art. Hey, maybe your groom has a Matchbox car that he always loved as a kid which is just sitting around waiting to be given new life as a funky boutonierre. It might not be appropriate for a formal wedding, but for a more casual and offbeat affair, almost anything goes. Handcrafted boutonierres are also a great look. 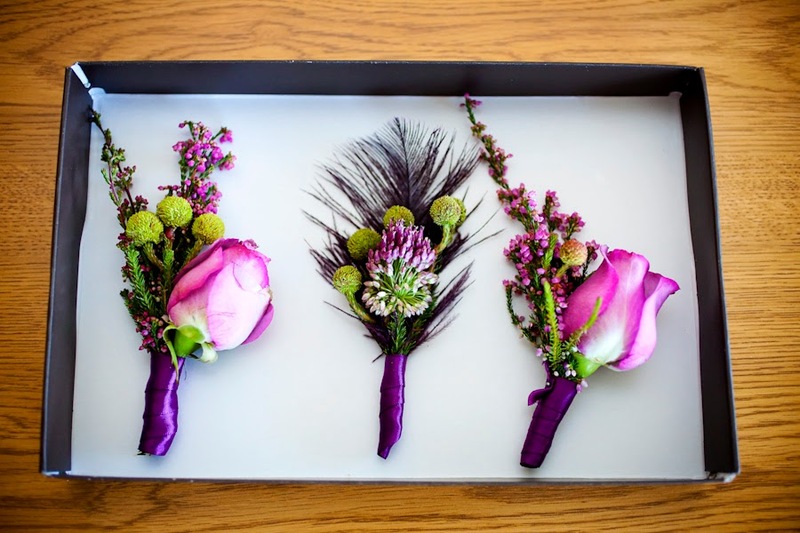 If you are planning a wedding which features many handcrafted elements, from your wedding jewelry to your invitations to the favors, a lapel ornament with a charming homemade feel could be ideal. This is something which a creative bride could make herself, or enlist the assistance of a local artist to do the honors. Think of elements like vintage velvet leaves, buttons, rickrack, and even bits of yarn for your bohemian handcrafted boutonierres. Finally, there are unique boutonierres which are flower-free, yet do coordinate with the bride's ensemble. Having a black tie wedding and wearing an ornate gown with plenty of sparkling wedding jewelry? 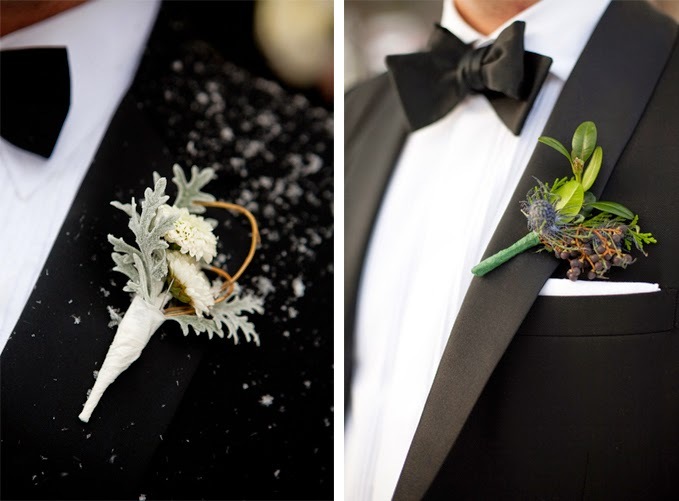 Then why not create a dramatic lapel ornament of glossy black feathers, glittery twigs and a few crystals for your groom? With a boutonierre this stylish, your handsome groom will feel just as good as you do on the wedding day!